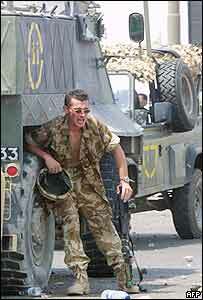 IRAK le 17 aout 2004 Une ambulance Land Rover attaquée. Captain David Jones, from Louth in North Lincolnshire, and two others who were injured had been heading for a hospital in Basra when an "improvised device" was detonated as they passed a lamppost. The soldiers were from the First Battalion Queens Lancashire Regiment based at Catterick, the Ministry of Defence confirmed on Friday. The Army believes the converted Land Rover they were travelling in - which was clearly marked with red crosses - was specifically targeted. "We will find the perpetrators of this act and bring them to justice in an Iraqi court," Major Charlie Mayo, the Army's spokesman in Basra, told BBC Radio 4's Today programmeHe added that the forces in Basra would not be deflected from their job by the attack. "This is not going to change the way we do business. "We will continue working with the local police, with whom we have a good relationship, and the local community which are well behind us. "Captain Jones, 29, had been married to wife Isobel for a year. In a short statement released on Friday she said: "I am extremely proud of Dai".